Journey is no stranger to awards. Just recently the game received two of them in the PSN Gamers' Choice Awards, the soundtrack was nominated for a Grammy, and a few weeks after its release it became the fastest-selling game in PSN history. 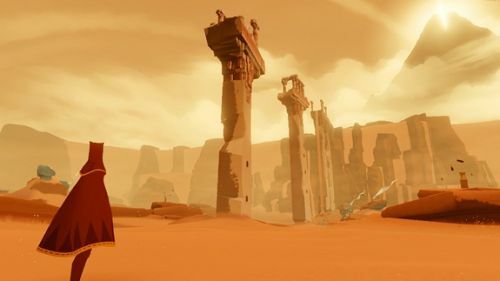 Now, developer thatgamecompany has to make some more room on the trophy shelf, as the British Academy Games Awards recently bestowed upon it five brand new awards. Competing against the likes of Dishonored, The Walking Dead and XCOM: Enemy Unknown, Journey took prizes in Online Multiplayer, Artistic Achievement, Game Design, Original Music, and Audio Achievement. High praise for everyone involved, and quite deserving of the accolades, if we do say so ourselves. If you still aren't reminded you need to check out Journey again, perhaps this violin medley and video will remind you to check it out one more time. Page created in 0.2811 seconds.